I couldn't tell you how many times I've walked into the liquor store, seen these Harvest Collection Jim Beam bottles, wanted to try them, and ultimately decided the price was just to prohibitive. I simply couldn't justify spending $50 on a .375 ml bottle, particularly on something that is experimental. However, at $20, I'm certainly more willing to try something different. So when Binny's put these on sale at $19.99, I grabbed this one and the Brown Rice. After all, a Jim Beam experiment with a different grain that has been aged for 11 years can only be so bad, and there's always the possibility that it's really good (though I'm guessing I would have heard about it by now if this were some amazing juice). In any event, at $20, I was happy to pick up a couple bottles to try them for myself. 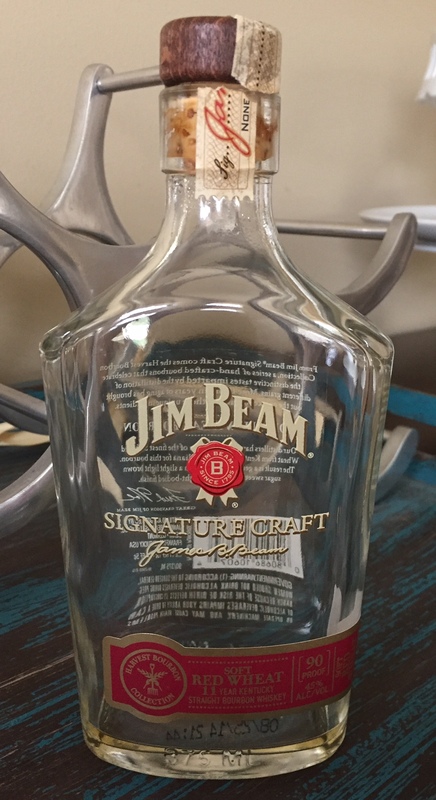 Being a wheated bourbon, albeit an experimental grain of wheat, I fully expected a sweeter version of regular Beam. That wasn't exactly what I found, though. While it is certainly a sweeter bourbon, I was surprised to find that it took a second for the sweetness to come through. However, that sweetness, once it did hit, stuck around for a while, with a buttery caramel flavor lingering at the back of the throat long after I swallowed. I actually enjoyed this bourbon more after I swallowed than I did upon the first sip. Up front it almost had a slight bitterness to it that I wasn't a very big fan of, but yet, after I was done, I found myself thinking, "That was pretty good!" Go figure. In addition to that buttery caramel note on the back end, there were also distinct hints of vanilla and oak, with a slight brown sugar tone up front. The oakiness of the bourbon is likely was contributed to that dry, bitterness up front. Because this comes in the 375 ml bottle, I didn't get to spend a whole lot of time with it, so I didn't notice a whole lot of change from the first pour to the last. I did, however, notice on later pours a toasted almond flavor that I didn't recall noticing at first. All in all, if this was an experiment by Beam, I think it was a good one. Certainly for a lower price this is a bourbon I would enjoy again. Unfortunately, though, it appears these small but pricey offerings are all we're going to get, so I'll just continue to look for similar sales on the others.